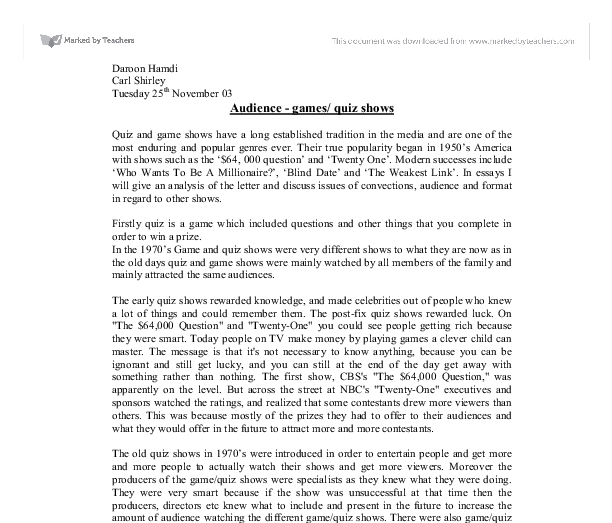 Audience - games/ quiz shows Quiz and game shows have a long established tradition in the media and are one of the most enduring and popular genres ever. Their true popularity began in 1950's America with shows such as the '$64, 000 question' and 'Twenty One'. Modern successes include 'Who Wants To Be A Millionaire? ', 'Blind Date' and 'The Weakest Link'. In essays I will give an analysis of the letter and discuss issues of convections, audience and format in regard to other shows. Firstly quiz is a game which included questions and other things that you complete in order to win a prize. 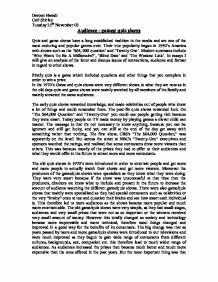 In the 1970's Game and quiz shows were very different shows to what they are now as in the old days quiz and game shows were mainly watched by all members of the family and mainly attracted the same audiences. The early quiz shows rewarded knowledge, and made celebrities out of people who knew a lot of things and could remember them. The post-fix quiz shows rewarded luck. On "The $64,000 Question" and "Twenty-One" you could see people getting rich because they were smart. Today people on TV make money by playing games a clever child can master. The message is that it's not necessary to know anything, because you can be ignorant and still get lucky, and you can still at the end of the day get away with something rather than nothing. ...read more. On the other hand you also get amusable shows that include presenters making jokes, this that were stand up comedies. They mostly make jokes at one member of the audience and pick them and put them as one the contestants. As a result of this 'happy' that is fun and loud tunes are played at the background, this type of music played attracts audiences as the game/quiz show is not so important or taken serious which many people find boring when they get serious. Moreover they use the type of music to demonstrate to their audiences what they are looking for and who they are looking for when considering their contestants. Secondly the lightening is also very effective as they also create tension and excitement for the audiences at home as it makes them test their own mind question asked or the task given to the contestants to perform. Therefore I believe that convectional/ rules of game/quiz shows are included so that more viewers are attracted entertained and manipulated by them to go on the show. Moving on to the presenters who present the game/quiz shows are presented as people who take things seriously and are the professional ones who have knowledge and are good at what they obviously do. ...read more. Moreover the audiences are the ones who actually then become the contestants of the show as they firstly watch it at home and then chose to go on the show to win the things they wished for. Therefore the shows are there to fulfill wishes as prizes such as big amount of money, cars, etc. can be won by the contestants depending on how smart they are. The weakest Link has therefore has a mass audience as they have mass contestants. However the University Challenge game/quiz shows tends to have programs that attract undergrads such as professionals and the main ones who are successful in life in the ones who are smart and respected all around such as doctors and lawyers. In conclusion I believe that game/quiz shows have changed in many different ways and have been improved as now days the audience can get involved in the shows and win prizes that not most people can not afford such as cars, home accessories etc. The gain more audiences the producers of the game/quiz shows introduced presenters who were well known for being a celebrity or for doing the job they did such as stand up comedies actors, actresses. Therefore by introducing these people they gained more audiences as the audiences found this known presenters interesting as they present the different shows. Daroon Hamdi Carl Shirley Tuesday 25th November 03 ...read more. All we know about him is that he is about 19-21 years old and that he may be around when trouble is caused. Because when the police officer first came to Judy's house the mother thought that it was Johnny that was in trouble. (Lifts glass up all together) BOB - Drink! (Necks down drink and coughs) (Everyone looks at him) JUDY - Drink! (Necks down drink) NOB - Drink! (Necks down drink, then shakes head) JO - Drink! (Sips drink) This play is very exaggerated (especially this scene) in terms of acting. there are 'two worlds' and she does not expect to be taken advantage of by her son. Bennett makes the audience feel as though Margaret does not fit in as she is described to 'plunge' into a room and is awkward in the way she holds herself. The shows I will be analysing for these features are: * Call my Bluff * Friends like these * 15 to 1 * Supermarket Sweep I also researched into times of different types of quiz and game shows by looking at the 'TV Times' and seeing which times and days were the most popular showing times. The initial round of "who wants to be a millionaire" is called "fastest finger first" this is a rapid round to select a contestant for the core game. "Fastest finger first" is a use of alliteration to emphasise the swiftness necessary. spotlight putting a lot of pressure on the contestants .the wheel of fortunes lighting is very bright with no spotlights anywhere this puts a relaxed and happy feel to the whole show .the lighting also stays the same all the way through so the feel to the show stays happy .The two sets are very different as well . Investigate the effects of an audience being present during a sporting task.